With all the transitions that happened this summer, we thought hey why not add one more? 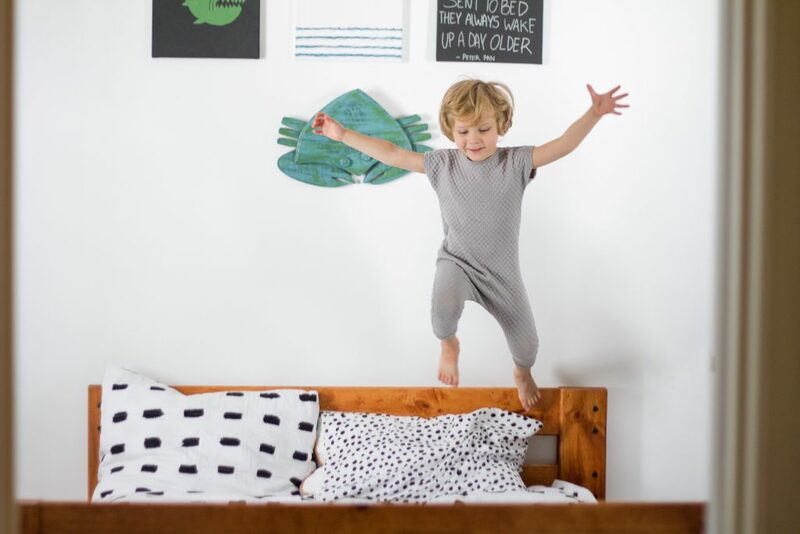 Between the ages of 18 months and 3 years, toddlers usually make the transition to big kid bed. Of course I was going to wait until the last minute. With him being our baby, we want to savor every moment. So Owen is now officially in a big kid bed. Let’s not talk about the sad part of my tiny little baby being a big boy! But let’s talk about the things we did to help him in the transition. And maybe they will help you too! Go crazy! Make it fun! Let them make it a big deal! Tell their friends and have a little family party! We told him that this was a huge step on becoming a big boy! He smiles a lot when we call him a big boy, and he is proud of it. As a part of building that excitement, we let him help choosing things and looking at beds, and also moving the bed into his room! He helped open everything that we got and every time it was a party. We don’t want to become so excited with the new room or new bed, that we forget about the safety of the child! They will now be able to roam free in the room, so check shelving to make sure it’s not loose’ secure dressers to walls, cover all those super exciting electric outlets, etc. There are many ways to help them feel secure. Have a routine! As a big boy, he knows that he can brush his teeth, pick out his pajamas, and pick out the book or the 16 books that he wants us to read. He also knows that in the morning, when he wakes up, he will be making his bed! like a big boy! 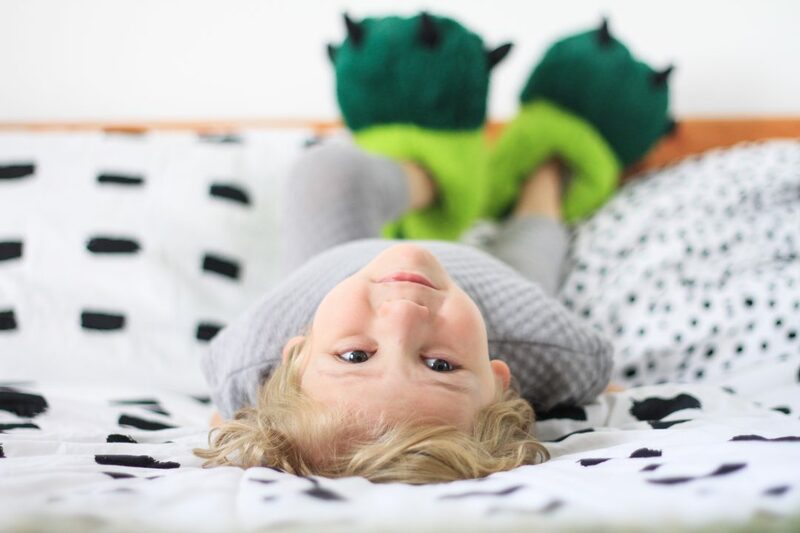 Thanks to his amazing big boy bedding from Beddy’s Bedding I need to take time here to tell you about it, because they are THAT amazing! First, they are adorable! and incredibly comfortable! Their designs are gorgeous and clean, so you are able to fit pretty much any style with them. And they also come with shams and pillow cases to match! Second, they had all the possible sizes! 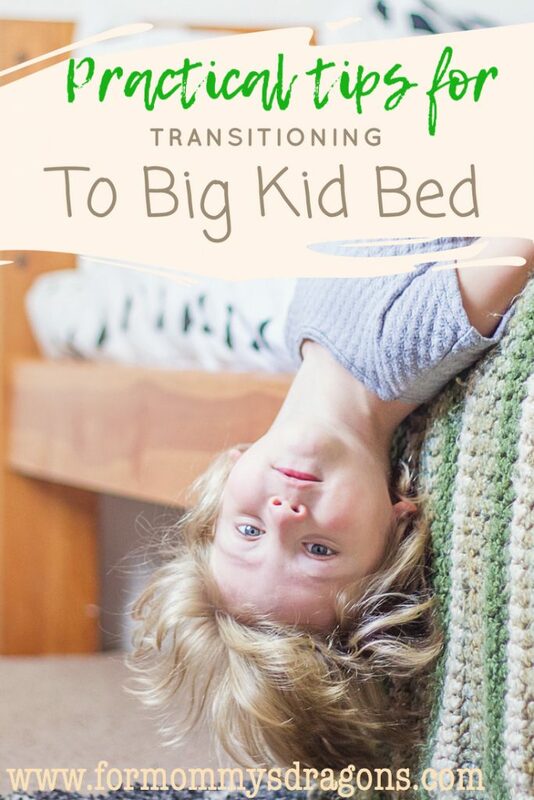 from baby crib to king size. Now here are Owen’s two favorite features! The inside is incredibly soft! 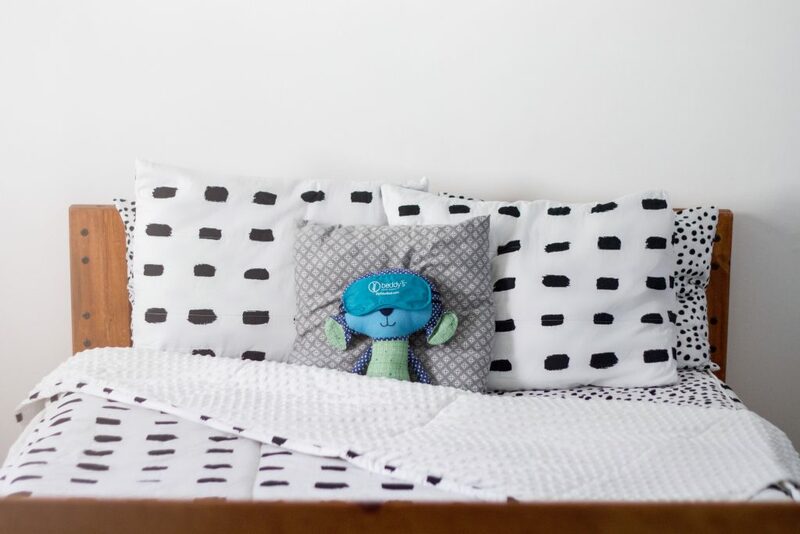 Soft cotton sheet and even softer minky fabric on the inside. So when he goes to bed, he is embraced in the comfiest and softest bed ever! He really loves being in his bed and wakes up so happy in the morning! 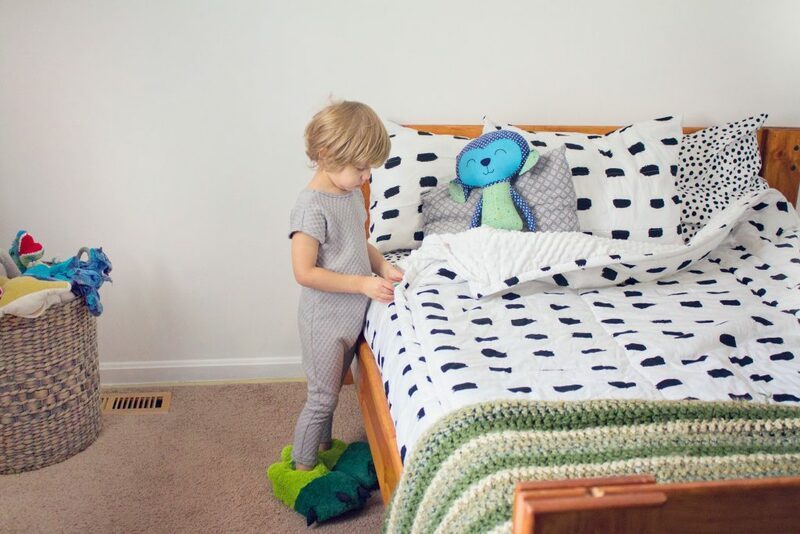 Owen also loves that after he wakes up, he can easily zip up the sides and have his bed made in minutes! It gives him the sense of accomplishment of a big boy! And as you guessed, this is one of my favorite features too! 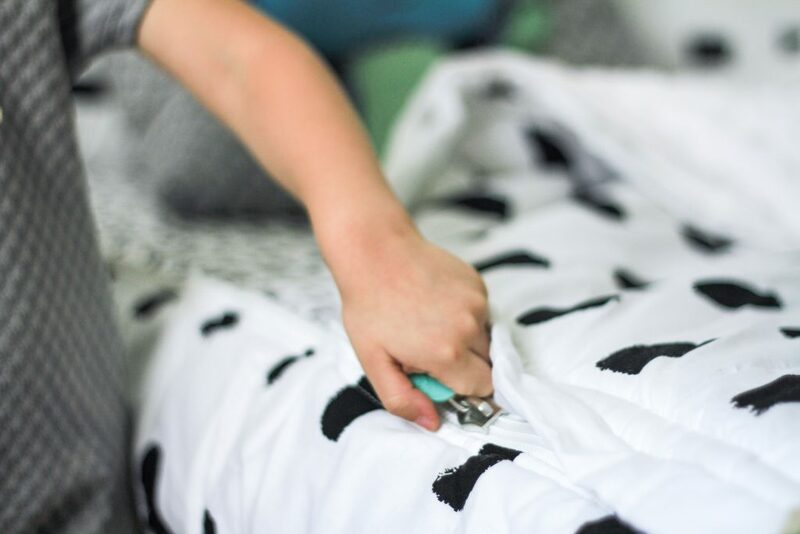 After wash, the entire bedding set goes on the mattress, you put it on like a fitted sheet and boom! You are done! the sheet is sewn in, and the super soft inner blanket is too! So he doesn’t get all tangled up in the flat sheet and then the blanket and then more stuff. none of that! And since he can make his bed by himself, I have extra time to try and drink my coffee before it gets cold. 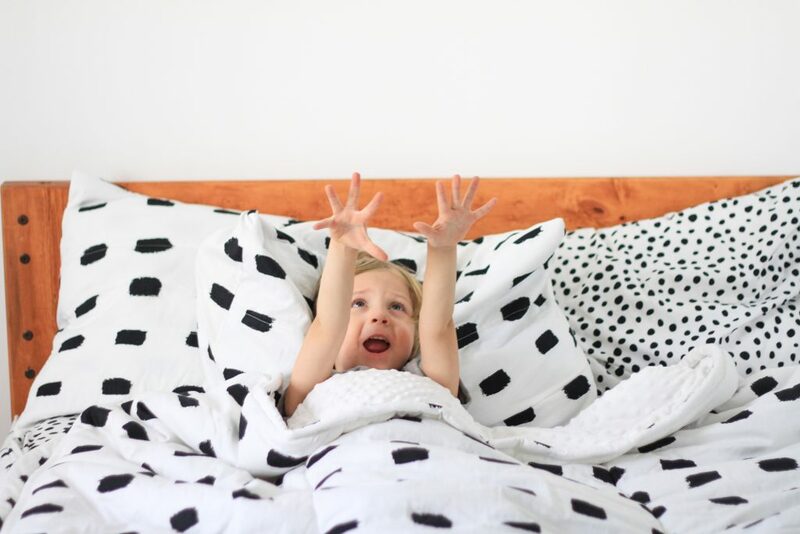 So if you are planning your little one’s new big kid bedding now, I recommend you to check out Beddy’s. I really don’t think that you will ever want any other bedding on your beds, ever. Yes they are really that good. Yes, change is hard! 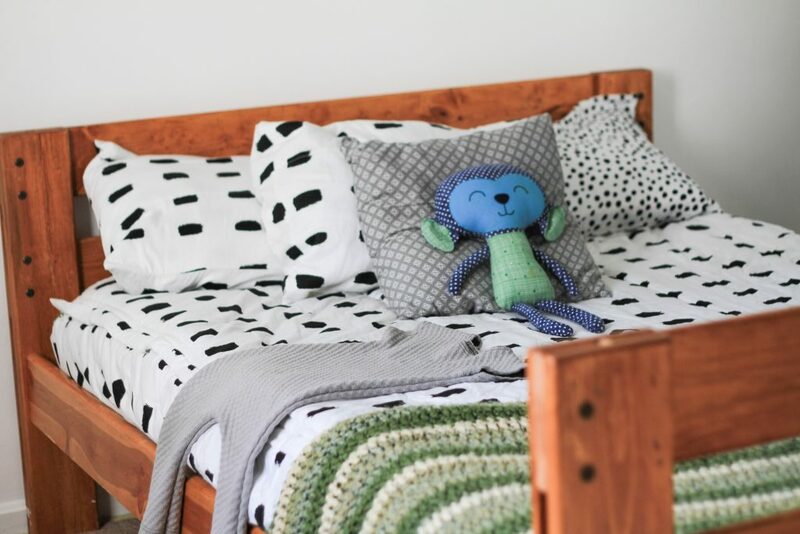 A new bed for a little babe, can be very intimidating, and while empathy and love are very important and necessary, try to make all your comfort into encouragement for them to know that it will be ok! Don’t change your mind and plans a lot, because it might just cause confusion and more heartache in the long run. Tell them that you also don’t like change some times, but that it usually brings nothing but excitement and new adventures. At the end of the day, nobody knows your child as well as you do! And nobody loves them as much as you do either! So have fun with it! Relax and help them relax also. Pretty soon you will both be making new wonderful memories around the new big bed, and the crib will be a thing of the past, yet never forgotten 😉 because they will always be your babies. For more tips on helping your little ones learn to be independent and self sufficient, check out my post on chores. and download your free chores chart. This is so cute! Your son is also so cute! My son is 3 months and he’s been sleeping with me throughout. So now I want to move him to his own cot because he’s the worst sleeper ever, lol! Any tips? Cool! I don’t have kids on my own so actually using this list is a far off thing. But I do remember my mom using this on my brothers and I growing up..
We always tried to sneak back into her room in the middle of the night! I do love when they sneak back in every once in a while! It’s a sweet reminder that they are still my babies. thank you for the comment!